The latest estimate is one in 40 kids have autism — and that doesn't necessarily mean the numbers are rising. 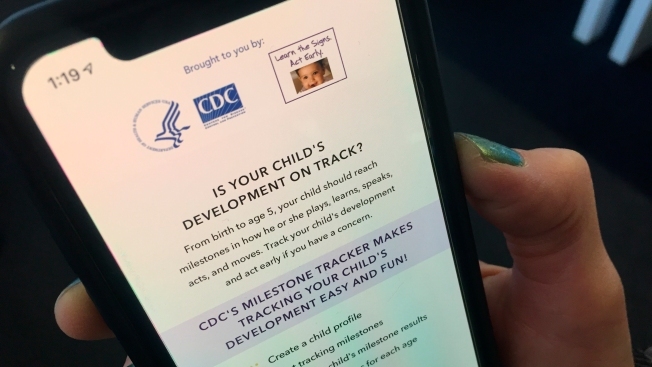 FILE - The Milestone Tracker phone app, created by the Centers for Disease Control and Prevention to help parents recognize developmental delays, is displayed on Nov. 22, 2018, in New York. The new number, published Monday in Pediatrics, is from one of three periodic surveys the government uses to assess autism rates. It's higher than a different survey's estimate published earlier this year, but the surveys use different methods and measure different populations of kids so the results aren't really comparable. Because there's no medical test, "autism spectrum disorder is a particularly challenging condition to track," government researchers wrote in the Pediatrics report. The true occurrence of autism likely ranges from about 1 in 59 kids to 1 in 40 kids, researchers say, taking into account information from all three surveys. "All contribute different information to form a fuller picture," said Michael Kogan, lead author of the new report conducted by the U.S. Health Resources & Services Administration, a federal agency. — The latest estimate is based on responses from about 43,000 parents of kids aged 3 to 17. They were asked if their child had ever been diagnosed with autism spectrum disorder, the formal name that encompasses mild to severe cases. The 2016 survey was internet-based; earlier ones were telephone surveys showing slightly higher rates but the researchers say the results aren't comparable. — The Centers for Disease Control and Prevention collects nationally representative information from in-person interviews. In 2016, it also asked parents of kids aged 3 to 17 about an ever-diagnosis of autism and came up with a rate slightly higher than in previous years but similar to the 1 in 40 estimate. Autism Speaks, an advocacy group, is among organizations that use the CDC's network estimate. It tends be more conservative and potentially more accurate than parents' reports, said neuroscientist Dean Hartley, a senior director for the group. Autism is a developmental disorder that can involve varying degrees of language and social impairments, often including repetitive behaviors. Experts say affected kids fare best with early diagnosis and treatment, but some doctors may dismiss early signs and some parents may be unaware of autism symptoms, the CDC's Dr. Stuart Shapira said. The Pediatrics survey found that about one-third of kids with parent-reported autism received no behavior treatment and showed that many parents had trouble getting services for their children, echoing earlier studies. Shapira noted the agency has a free Milestone Tracker phone app to help parents recognize developmental delays.